Nokia E1, the dream gadget of high-end smartphone lovers coming to rock and rule the world market as Nokia E1 appeared online with specifications and images which expected to launch by Q1 2017 will be priced expected to cost you approx. Rs 35,000. Nokia also confirmed to launch Nokia C1 Android budget smartphone in Q1 2017 priced under Rs 10,000 and planning to launch mid-range Nokia C9, Nokia C2 Android smartphone in Q4 priced under Rs 15,000. According to latest leaks, Nokia E1 will comes with a One-piece design, Aluminum with surface anodization will be powered by a 64 bit 2.6 GHz Intel processor with 4GB RAM, 32GB in-built memory and 64GB external memory will sport a 20-MP rear camera for shooting and 5-MP front camera for clicking selifes and making video call will be powered by a powerful 2700mAh battery. 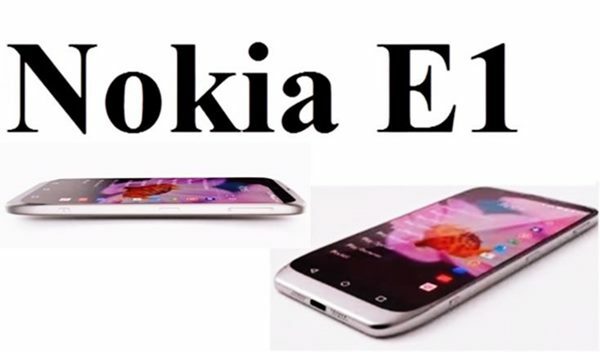 Nokai E1 will support Dual-SIM(GSM+GSM) with 4GLTE, Wi-fi, Bluetooth, GPS and USB offers you a bigger 5”-inch Full HD(1920 x 1080) display with Gorilla Glass 3, Fully laminated zero air-gap display will run on Android 6.0 Marshmallow with Nokia’s Z launcher like N1 Tablet. However no official confirmation from Nokia so far. Buy other Nokia Smartphones from Flipkart. At last Few honest word from heart that upcoming Nokia E1 going to be the game changer for Nokia in gadget market. What you think? Please stay tuned for more updates and be open to give your view.